In today’s “View from the Philly Pressbox” we preview the Round 1 series between the Flyers and the Penguins. This is a pretty easy review from our standpoint. For the Flyers there are four keys to winning the series. Obviously, there are a great deal of things that play in to the four things noted above. The Flyers have to come out of the locker room ready to play. They must put pressure on Penguins goalie Marc-Andre Fleury from the opening whistle of Game 1 and every other game. They cannot continue to try to play comeback every game. Falling behind by one goal will be difficult to overcome, falling behind by two goals will be impossible. The effort required for these “comebacks” drains a great deal of extra energy. The Flyers need to jump on the Penguins early and force them to have to play from behind. The Flyers must play solid defense and two way hockey for Bryzgalov to be good. However, Bryz must step up his game, as he did in the last third of the season, and make the big saves when the defense breaks down. Bryz brings 33 wins and a 2.48 GAA (Goals Against Average) in to the playoffs, but as we know the regular season statistics don’t mean anything. What is important is this, is the goalie playing well going in to the playoffs? In Bryz’ case he went from cold to white hot to cooling off some but still playing well at the end of the season. Of course another obvious key in the run to the Stanley Cup is staying healthy throughout the brutal playoff run. The Flyers appear to be as healthy as a team can be at this point. Bryz will benefit from having his full complement of defensemen. Having Nicklas Grossmann back will be big for the Flyers. Staying out of the penalty box will be critical. The Flyers cannot let Sydney Crosby, Evgeni Malkin, 50 g, 59a, 109 points with 12 PP goals, James Neal, 40g, 41a, 81 points and 18 PP goals have space to skate. The Penguins also got 26 goals from Chris Kunitz, 25 from Pascal Dupuis and 25 from Jordan Staal. They can be very dangerous on offense. The Flyers need to be physical throughout the series but cannot afford any bad penalties that could put them in a hole. For the Flyers to win they need to get contributions from all of their lines. Obviously, the Claude Giroux, Scott Hartnell, Jaromir Jagr line needs to be good. Danny Brierre needs to step up as he has in past playoffs. Wayne Simmons, Max Talbot and Jakub Voracek will need to contribute as they have all season. Just as important will be the play of the Flyers rookies, Matt Read, Sean Couturier and Brayden Schenn. These rookies have played very well throughout the regular season, however, they need to lift their game to the next level that is playoff hockey! Our prediction is the Flyers in 6 games if they can manage the keys discussed above. These teams are very equal as the regular season showed. Bryz must be outstanding and Crosby and Malkin must be controlled. Obviously, the critical game is Game 1 tonight in Pittsburgh to gain series momentum. 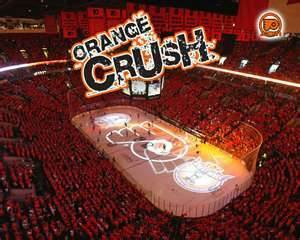 If the Flyers can gain a split on the road they will be in good position for two wins at the Wells Fargo Center in Games 3 and 4. A loss in Game 5 in Pittsburgh and the clincher in Game 6 back at home. The talking is over; it’s time to drop the puck!